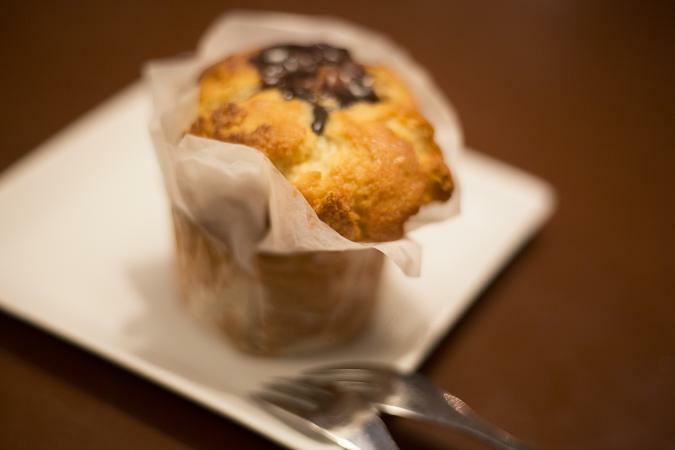 Gourmet muffins are oversized with touches that may include nuts, fruits, herbs, spices, and flavorings. These special muffins may have a glaze, be topped with a streusel or cinnamon sugar, or have a unique filling. You will need a jumbo muffin tin for these recipes. The combination of chocolate chunks and toasted cashews is very special. A cinnamon swirl inside the muffin adds more delicious flavor. This muffin recipe is simple but elegant. Preheat the oven to 400°F. Line 8 jumbo muffin cups with parchment paper or muffin liners, or spray with nonstick baking spray containing flour. In a large bowl, combine the butter, 1/2 cup granulated sugar, and brown sugar and mix well. Add the eggs and beat well. Beat in the cream and vanilla. In a medium bowl, combine the flour, baking powder, baking soda, and salt and mix. Add to the butter mixture and stir just until combined. In a small bowl, combine 9 tablespoons granulated sugar and cinnamon and mix. Stir the chocolate chunks and cashews into the batter. Start filling the muffin cups. Fill each halfway, then sprinkle each with 2 teaspoons of the cinnamon sugar. Use a sharp knife to swirl the batter and sugar together. Then top with the remaining batter. Sprinkle with the remaining cinnamon sugar. Bake the muffins for 15-25 minutes or until they spring back when lightly touched on top. Remove the muffins to a wire rack to cool. To toast the cashews, put the chopped nuts on a baking pan and bake at 350°F for 4 to 7 minutes or until the nuts are fragrant. You can use other types of nuts in this recipe: pecans or macadamia nuts would be delicious. Other types of chocolate can be used too: use milk chocolate or chop some chocolate Kisses. The combination of raspberry and caramel makes a fabulous muffin. 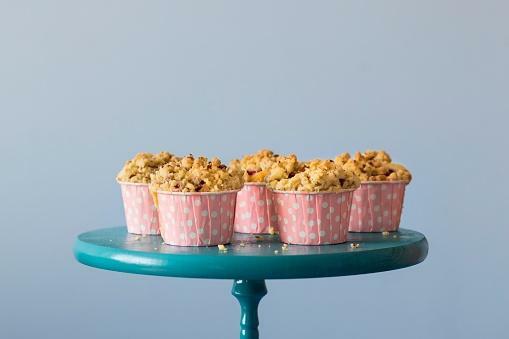 And the crumbly streusel on top of these tender muffins adds a special touch. Preheat the oven to 400°F. Spray 8 jumbo muffin cups with nonstick baking spray containing flour. In a large bowl, combine the flour, 1 cup brown sugar, baking powder, baking powder, and salt and mix with a wire whisk until combined. In another bowl, combine the eggs, 1/2 cup melted butter, cream, milk, and vanilla and beat until combined. Stir the egg mixture into the flour mixture until combined. Do not over beat. Gently stir the raspberries into the batter. To make the muffins, fill each prepared muffin cup 1/2 full. Drizzle 2 teaspoons of the caramel sauce over the batter. Top with remaining batter. For the streusel, combine 1/2 cup brown sugar, 5 tablespoons flour, oatmeal, and pinch of salt in a medium bowl. Add 1/3 cup melted butter and mix until crumbly. Sprinkle over the muffins. Bake the muffins for 22 to 27 minutes or until a toothpick inserted into the center comes out clean. Cool the muffins completely on a wire rack. You can make these muffins with other fruits. Some chopped strawberries would work well, as would blueberries. Make sure you don't over beat the muffin batter or they will be tough. To measure brown sugar correctly, pack it firmly into the cup. The sugar should hold the shape of the cup when you turn it out. 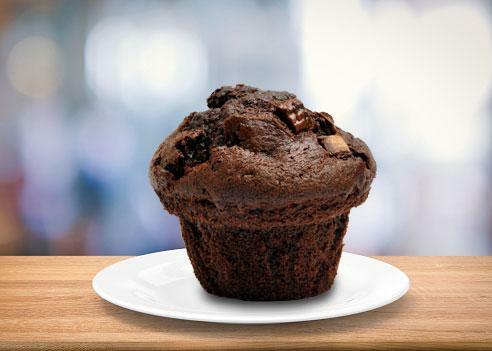 While chocolate muffins are good, triple chocolate muffins are even better! Cocoa powder in the batter makes these muffins very tender. A good amount of chocolate chips adds texture and interest, and melted white chocolate is swirled into the batter. Preheat the oven to 400°F. Spray 8 jumbo muffin cups with nonstick baking spray and set aside. In a large bowl, combine the butter with the granulated and brown sugars and beat until fluffy. Beat in the eggs, one at a time. Sift together the flour, cocoa power, baking powder, baking soda, and salt. In a small bowl, combine the milk, sour cream, and vanilla and mix with a wire whisk. Add the dry ingredients alternately to the sugar and butter mixture with the milk mixture, beginning and ending with the dry ingredients. Fold in the semisweet or milk chocolate chips. Melt the white chocolate chips in the microwave oven on 30% power for 1 to 2 minutes. Fill each muffin cup with half of the batter. Drizzle in some of the melted white chocolate chip mixture. Top with the remaining batter. Bake the muffins for 18 to 22 minutes or until they spring back when lightly touched. If you want even more chocolate, you can melt some milk chocolate chips and drizzle over the cooled muffins. There are new and different fun swirled chocolate chips that would be great in these muffins. Try white and dark swirls, or peanut butter and chocolate. For any of these recipes, you can make a dozen regular sized muffins if you'd like. Just use a regular muffin tin and reduce the baking temperature to 350°F and the baking time by 3 to 5 minutes. Now that you know how to make gourmet muffins, you can branch out and create your own wonderful treats. Just follow the basic ingredient amounts and add your own favorite additions.